This is the thirteenth volume! 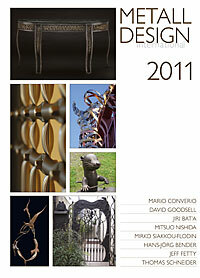 With accustomed high quality and carefully selected photos "Metall Design International 2011" shows the work of eight metal designers from five countries. These include Mitsuo Nishida from Japan, the Italian Mario Converio, the German designers Hans-Jörg Bender and Thomas Schneider, as well as Jiri Bat´a from the Czech Republic and Jeff Fetty from the U.S.A.